Recent years have seen remarkable advances in the development of a new approach to the acceleration of subatomic particles. This strategy makes use of the intense electric fields associated with pulsed, high-energy laser beams to accelerate electrons and protons to ‘relativistic’ velocities (i.e. speeds approaching that of light). Hitherto, the laser shot has generally been directed at a thin metal foil, generating and accelerating a plasma of free electrons and positively charged ions. Physicists at LMU have now replaced the foil target by a plastic microsphere with a diameter of one-millionth of a meter. These beads are so tiny that they cannot be stably positioned by mechanical means. 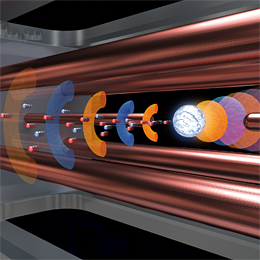 Instead, the researchers use an electric field to levitate the target particle. Using a feedback circuit, the levitated bead can be trapped with sufficient precision to ensure that it does not drift off the beam axis. The electromagnetic trap was designed and built in the Department of Medical Physics at LMU. “The basic approach is analogous to collisions between billiard balls. In our experiment, one of the balls is made of light and the other is our tiny levitated target,” explains Peter Hilz, who led the experiments. This novel approach to the generation of proton beams will make experiments feasible which have hitherto been out of reach.